A few months ago, one of the ladies asked me if I could help with communion, setting it up three or four times a year. I would be replacing a woman who had been showing signs of dementia. I had my first turn this last week. One of the ladies showed me where the supplies were kept — the chalices and plates, the pretty linens, and a six-pack of bottles of grape juice. Until I asked about the bread. “You can get any bread,” the woman told me. I angsted over communion bread all week. I couldn’t get just any old bread. This was the body of Christ, for crying out loud. Our church offers communion by intinction. The pastor tears a chunk off the loaf of bread (yeast bread) and offers it to the communicant, who then dips it in the chalice. I know that some churches use matzoh, or unleavened bread, because that’s what Jesus would have used during His last Passover supper. Others use leavened bread, a reminder of new life and a new covenant. Some churches use wafers and believe in transsubstantiation. Some churches use individual cups. Others use chalices. Some churches use wine. Others use juice. Some celebrate the Eucharist weekly, others monthly, and still others yearly. However it’s done, all Christians unite in this mystery that goes beyond time and space and a morsel and a taste of juice. The blood of Christ shed for you. I struggled with what to bring for the communion bread. I prayed about it. I wrestled with in my heart. I looked at bread at the grocery store and at the local bakery. Then I prayed some more. Finally, I decided to try to make the bread. I pictured myself kneading the dough and praying for the people in our congregation. I brought the bread to church in a brown paper bag. I didn’t want anyone to know that I had made it. Bud helped me set everything up on the altar. The moment in the service came when Pastor Tom lifted the bread for all to see. “This is Christ’s body, broken for you,” he said, as he broke the loaf in half. As luckfateGodcoincidencechance would have it, Pastor Tom asked me to stand beside him for communion and hold the chalice. I watched him tear off chunk after chunk of bread. I tried to focus on my words — “The blood of Christ shed for you” but the bread was so distracting. The pieces got larger and larger. One woman laughed as she received a piece so large that she had to tear it in half to dip in the chalice. I laughed, too. It was comical. After the service, she came up front to talk with the pastor. “You got your whole lunch there,” I said to her, nodding towards the communion trays. Isn’t that the crux of communion — a God so generous that He gave His son. 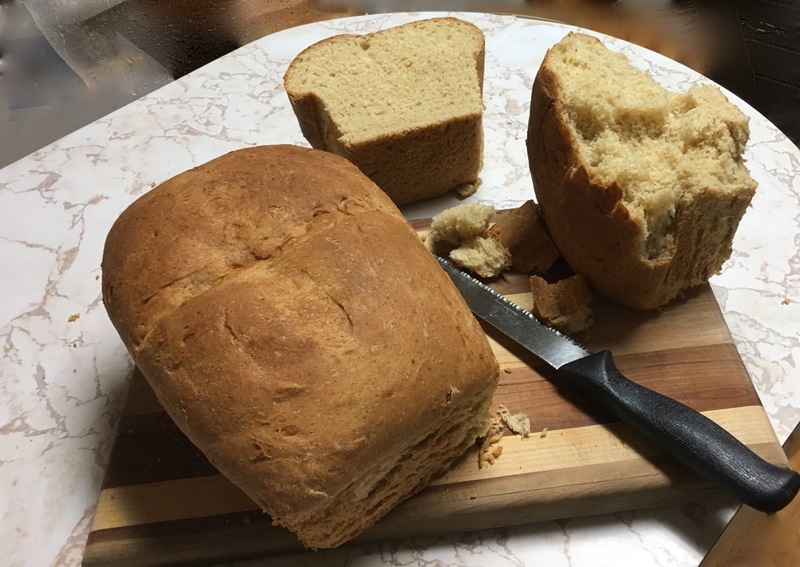 The bread wasn’t perfect — but then, neither am I. And God honored the bread. My parents tended to handle the communion wine for some years, in terms of buying it when the church was to hold communion. I think that fit in with the period of time my father was a deacon.